Scientists developed and validated a high-resolution mass spectrometry method to fill data gaps in existing methods that detect the surfactant DOSS, a significant Corexit component, in sediments near the Deepwater Horizon spill site. The LC-QTOF-MS (LC-high mass accuracy quadruple time of flight mass spectrometry) method improved the sensitivity and selectivity required to detect small quantities of DOSS. The resulting analyses confirmed the presence of DOSS in deep-sea Gulf sediments. The researchers published their method and findings in Analytical and Bioanalytical Chemistry: Selective quantification of DOSS in marine sediment and sediment-trap solids by LC-QTOF-MS.
One of the response efforts to the 2010 oil spill was the application of unprecedented amounts of chemical dispersants. Researchers often use DOSS (bis-(2-ethylhexyl) sodium sulfosuccinate) as a surrogate marker to detect Corexit in the water column and sediments. Detecting DOSS requires the ability to measure very small amounts as it dilutes and degrades over time; however, the only study that quantified DOSS in Gulf sediments reported limited performance metrics and did not include a validation or application of the method used. This study provides a fully validated analytical methodology for quantifying DOSS in sediment material and the first evaluation of DOSS in sediment trap solids. 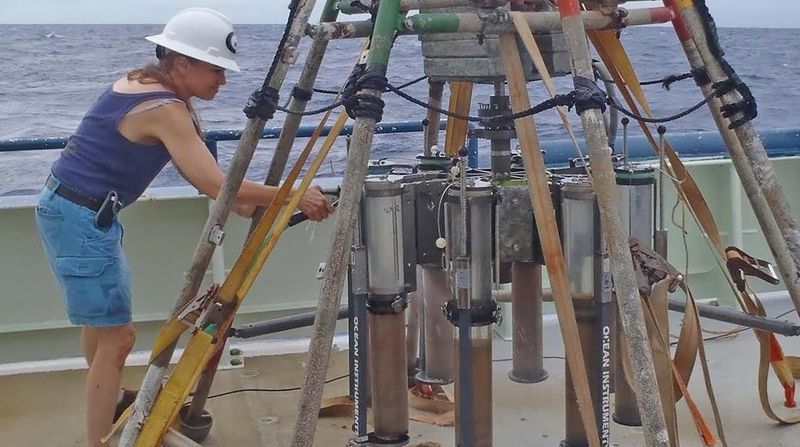 The researchers collected sediment cores and sediment-trap solids near the Macondo wellhead during 2010 – 2013. Interferences from complex organic and inorganic matter confounded preliminary analyses that used LC-MS/MS, and attempts to “clean up” sample extracts to resolve the interferences proved ineffective. The researchers then developed and validated the LC-QTOF-MS method, which resolved this problem. The high mass accuracy of the LC-QTOF-MS method provided additional selectivity for DOSS by confirming the exact mass and isotopic distribution of significant molecular and fragment ions. The results agreed with time-matched standards, indicating a high confidence for small compound identification. The team’s future work aims to more clearly explain spatial and temporal trends in post-spill DOSS occurrence using a larger set of Gulf sediments and sediment-trap solids collected from 2010 – 2015. “Documenting the footprint and persistence of DOSS in Gulf sediments is an important part of understanding the fate of organic components in the approximately seven million liters of Corexit applied during the oil spill response,” said Field. Data are publicly available through the Gulf of Mexico Research Initiative Information & Data Cooperative (GRIIDC) at doi:10.7266/N7B56GP8. The study’s authors are Matt J. Perkins, Samantha B. Joye, and Jennifer A. Field.